Posted on April 12, 2018 Leave a comment on FREE! MY NEW FANTASY-COMEDY IS ABSOLUTELY FREE FOR TODAY! The first novel in my latest series is available to download, now! 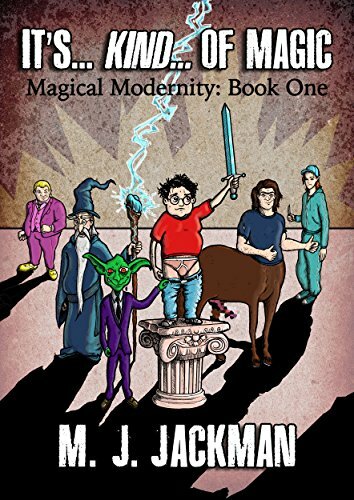 It’s…Kind…of Magic is the first in a four-book fantasy-comedy series, Magical Modernity. Set in the modern world, where orcs, goblins, elves and humans live side by side, It’s…Kind…of Magic is a far cry from The Sid Tillsley Chronicles, my debut series of vampire horror-comedies. However, if you enjoyed Sidney’s antics, then you’ll probably find this amusing. If you’re new to my writing, then the Magical Modernity series is what Pratchett would have written if he had no understanding of commercial and mainstream appeal, and didn’t understand the basics of sentence composition. Currently available exclusively on Kindle, paperback versions will be available soon. The second in the series, Steroids and Sorcery will be released at the end of 2018. What’s even nicer to report is I’m averaging a really high mark: 4.76. Officially, I’m a pretty big wheel down at the cracker factory.